PL/SQL is procedural language, that's very useful when you work with Oracle Database. As DBA, you might have to write PL/SQL to do some tasks. Developer on Oracle Database must know about PL/SQL. 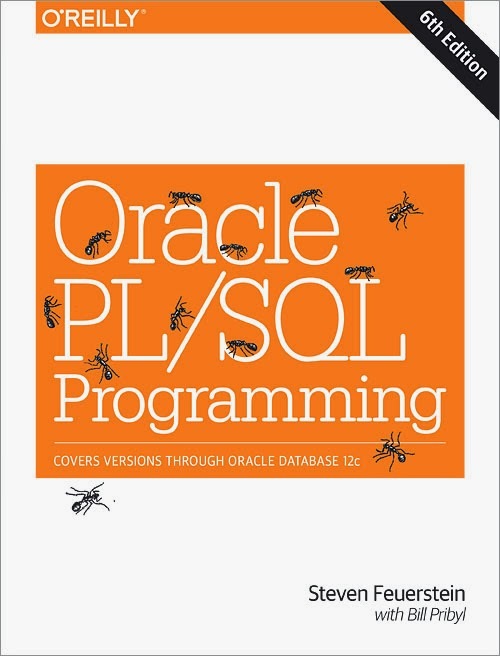 This post I mention a book title - Oracle PL/SQL Programming by Steven Feuerstein (@stevefeuerstein), Bill Pribyl. This book is a new edition that covers PL/SQL on Oracle Database 12c. Readers can use examples in a book for practice and get many ideas for programming in PL/SQL. A book is easy to read and make understand in PL/SQL. Readers can use a book as guidance and learn a lot of real-world problems with great Authors in PL/SQL. PL/SQL Developers should not miss this book. In a book, Reader will see 28 chapters in 6 parts.